Young Planning Professionals (YPP) from various parts of the world congregated in Brisbane last week for the ISOCARP Young Planning Professionals Workshop. Jensen Bowers’ very own Senior Planner, Laura Gannon, chaired the 4 day intensive planning workshop and presented to the international conference. Organised as part of the 49th annual ISOCARP congress and hosted by the Brisbane City Council from 1-4 October 2013, the YPP Workshop was brief, but intense, brainstorming planning and design exercises in which young planning professionals (under the age of 35) work on real-life planning issues. The workshop is hands-on and seeks to establish solid working relationships between young professionals from all parts of the world who together seek final findings and results in a short period of time. 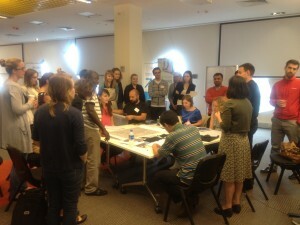 Delegates from Russia, Poland, Norway, Turkey, Portugal, Pakistan, China, Ivory Coast, US etc collaboratively explored planning solutions for the topic “Howard Smith Wharves: Inner City Rejuvenation and Urban Connectivity”. The Howard Smith Wharves, constructed in the 1930s, is a riverside precinct comprising heritage-listed industrial buildings which remain one of the last surviving connections to Brisbane’s development history. Visit the ISOCARP website for more information on the 49th annual ISOCARP congress.